Neanderthals are often depicted as having straight spines and poor posture. However, these prehistoric humans were more similar to us than many assume. University of Zurich researchers have shown that Neanderthals walked upright just like modern humans - thanks to a virtual reconstruction of the pelvis and spine of a very well-preserved Neanderthal skeleton found in France. An upright, well-balanced posture is one of the defining features of Homo sapiens. In contrast, the first reconstructions of Neanderthals made in the early 20th century depicted them as only walking partially upright. These reconstructions were based on the largely preserved skeleton of an elderly male Neanderthal unearthed in La Chapelle-aux-Saints, France. Since the 1950s, scientists have known that the image of the Neanderthal as a hunched over caveman is not an accurate one. Their similarities to ourselves - both in evolutionary and behavioral terms - have also long been known, but in recent years the pendulum has swung in the opposite direction. "Focusing on the differences is back in fashion," says Martin Haeusler, UZH specialist in evolutionary medicine. For instance, recent studies have used a few isolated vertebrae to conclude that Neanderthals did not yet possess a well-developed double S-shaped spine. However, a virtual reconstruction of the skeleton from La Chapelle-aux-Saints has now delivered evidence to the contrary. This computer-generated anatomical model was created by the research group led by Martin Haeusler from the University of Zurich and included Erik Trinkaus from Washington University in St. Louis. 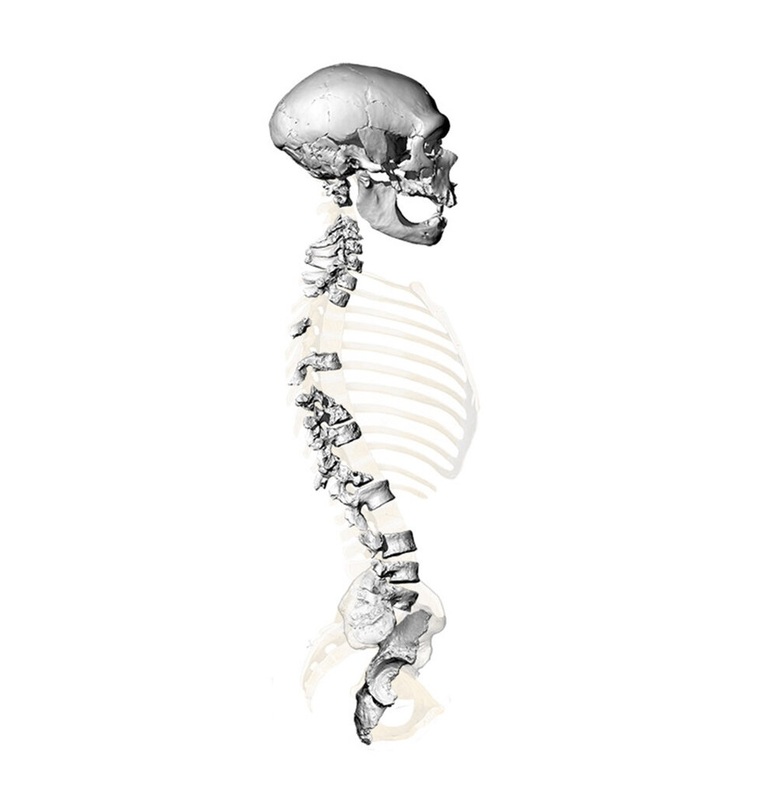 The researchers were able to show that both the individual in question as well as Neanderthals in general had a curved lumbar region and neck - just like the humans of today. When reconstructing the pelvis, the researchers discovered that the sacrum was positioned in the same way as in modern humans. This led them to conclude that Neanderthals possessed a lumbar region with a well-developed curvature. By putting together the individual lumbar and cervical vertebrae, they were able to discern that the spinal curvature was even more pronounced. The very close contact between the spinous processes - the bony projections off the back of each vertebra - became clear, as did the prominent wear marks that were in part caused by the curvature of the spine. Wear marks in the hip joint of the La Chapelle-aux-Saints skeleton also pointed to the Neanderthals having an upright posture similar to that of modern humans. "The stress on the hip joint and the position of the pelvis is no different than ours," says Haeusler. This finding is also supported by analyses of other Neanderthal skeletons with sufficient remnants of vertebrae and pelvic bones. "On the whole, there is hardly any evidence that would point to Neanderthals having a fundamentally different anatomy," explains Haeusler. "Now is the time to recognize the basic similarities between Neanderthals and modern humans and to switch the focus to the subtle biological and behavioral changes that occurred in humans in the late Pleistocene." Thanks, the paper of Häusler et al. in PNAS shows that Neandertals had lumbar lordosis as in modern humans, or even more pronounced: this shows they had their head, body & legs in 1 line. The paper repeats the traditional idea that "a fully upright and balanced posture is one of the hallmarks of humanity", but is this so? Other primates such as gibbons, spider monkeys & tarsiers are as upright as we are, not for walking on the ground, but for walking over, hanging from, or clinging to branches. Bipedal cursorial animals in open plains such as ostriches & kangaroos run or jump with horizontal spines, whereas we see bipedal & vertical postures when bonobos or lowland gorillas wade in forest swamps for sedges, frogbit or waterlilies, google e.g. "gorilla bai" & "bonobo wading" illustrations. Humans don't hold their heads nicely balanced above their bodies, just see how humans walk, and even less so when we run: our nuchal musculature keeps our head from falling forward. Traces of cattails have been found on Neanderthal stone tools, and traces of waterlily roots in their dental plaque (Henry cs 2011 PNAS 108:486-491), which suggests Neanderthals, regularly or occasionally, collected shallow-water & waterside plants. In fact, the paper of Häusler et al. fully corroborates our hypothesis (based on comparative-anatomical, paleo-environmental, nutritional & isotopic data) that Neandertals were wetland omnivores who seasonally followed the river to the coast, google e.g. "coastal dispersal 2019 Verhaegen".